Today festivals reign supreme over all forms of live music consumption. They offer the sounds, the scene, the social media posts, and the sense of being at the center of something important and bigger than oneself. 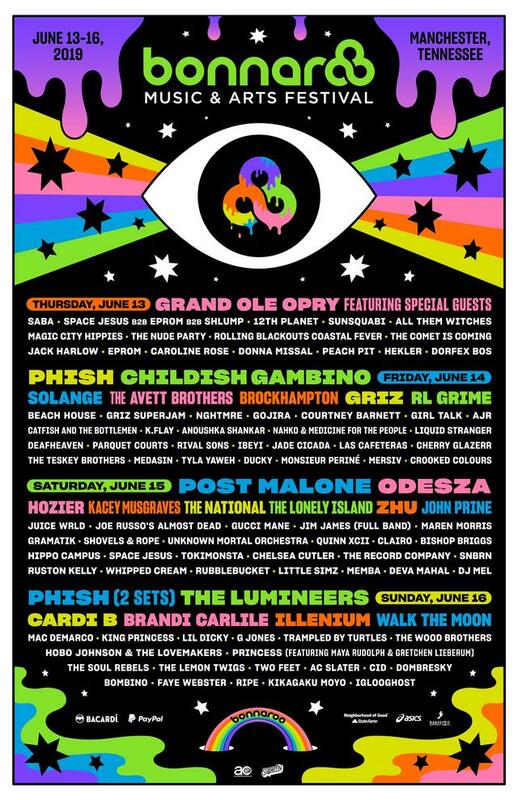 It's almost becoming inaccurate to say that we are about to enter "Festival Season"-- South by Southwest ended in mid-March, Ultra two weeks after that. A countless number of vast, multi-concert events will be offered from now until early September. That’s basically a full six months of Festival Season. At the same time, hip-hop has become the most popular music genre in the country. And it has mostly been absorbed into that festival machine. The biggest festivals are attracting the biggest stars, and therefore the biggest hip-hop acts. Kendrick at Coachella, 21 Savage at Lollapalooza. Some artists, such as J. Cole, are trying to fight the inequities by bringing festivals to their home states, to take back ownership of their culture. And the larger festivals, it can be argued, are helping to put on small acts too, people who will go on to have small, affordable tours. Below we have compiled a list of some of the biggest festivals to look forward to in the coming months, with focus on the hip-hop acts you’ll have a chance to see there. We've only listed those festivals that have already announced lineups. 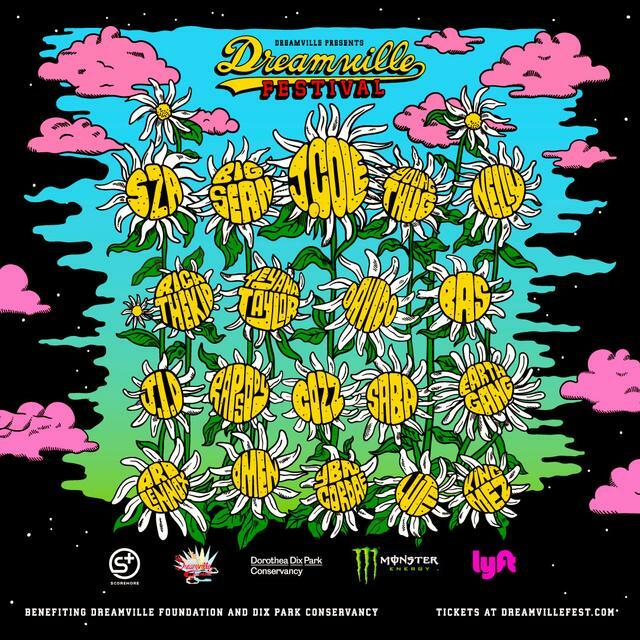 Cole’s homegrown recording label debuts its homegrown festival celebrating Dreamville’s best and their favorite collaborators. After encountering setbacks that pushed the concert back from 2018, J. Cole promises an intimate, one-day event in Dorothea Dix Park. And, uniquely, this promises to be a family friendly event, with children under 3 ½ feet tall admitted for free when accompanied by an adult. 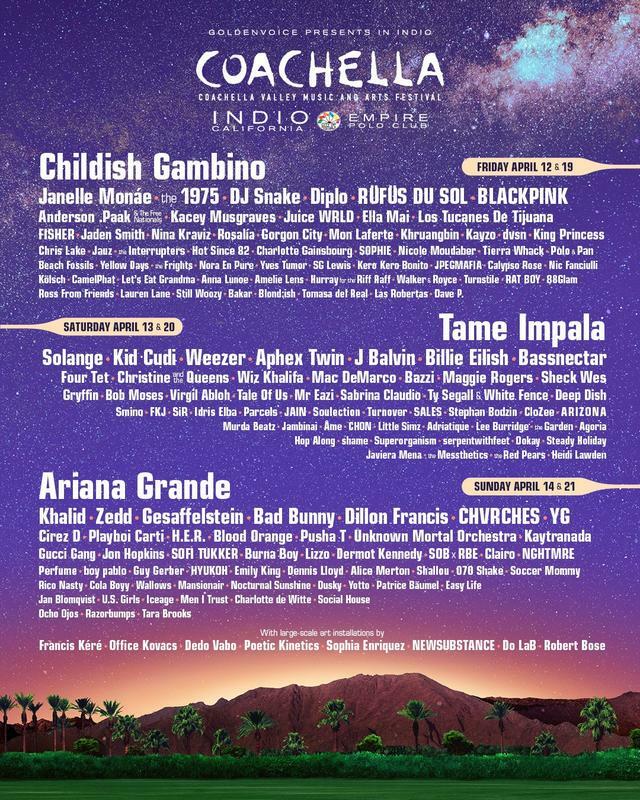 No event has done more to commercialize and glamorize music festivals than Coachella. The two-weekend event is the Mecca of music festivals. Attendance has become as much about music as it has a statement on how hip you are with the celebrity and pop-culture moment. This may be the year of hip-hop festivals turning back toward regionalism. And if this is the start of that trend, it begins with Pharrell. Like J. Cole, Pharrell is bringing the music back to his hometown, except he’s going way bigger. In the last few months Pharell has attended city council meetings, he’s put out a plea for locals to turn their homes into Airbnb locations, and he’s recruited some of hip-hop’s biggest names. This is an event for oldheads and young kids, and isn’t even exclusively hip-hop. “The Largest Hip-Hop Festival in the World” is the story of a festival that almost wasn’t. Its debut in 2015 saw ticket scanner malfunctions, fires requiring evacuations, and several inches of rain. But the music was great and the chaos made fans feel like it was some “real” hip-hop, and now Rolling Loud is so big it has spawned a winter concert in Los Angeles. This year the festival celebrates its fifth anniversary, and things couldn’t look better for them. 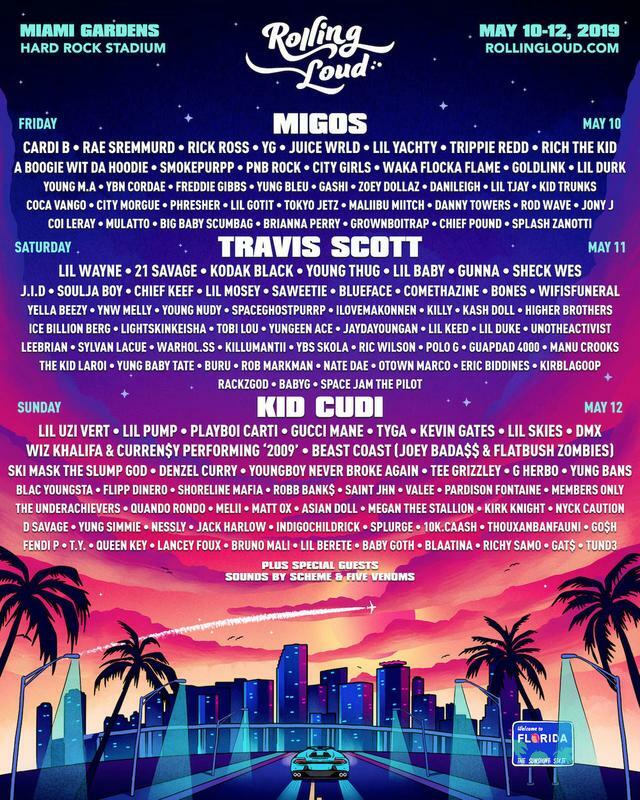 With Miami at the center of SoundCloud rap, we predict Rolling Loud will become a fixture of hip-hop festivals for years to come. Debuted in 2011, the Neon Desert Music Festival was for a long time a low-key, indie music event that gave the Southern U.S. a chance at a unique festival environment. While its headlining slots have been taken over by the biggest pop acts, it remains largely an indie music festival. 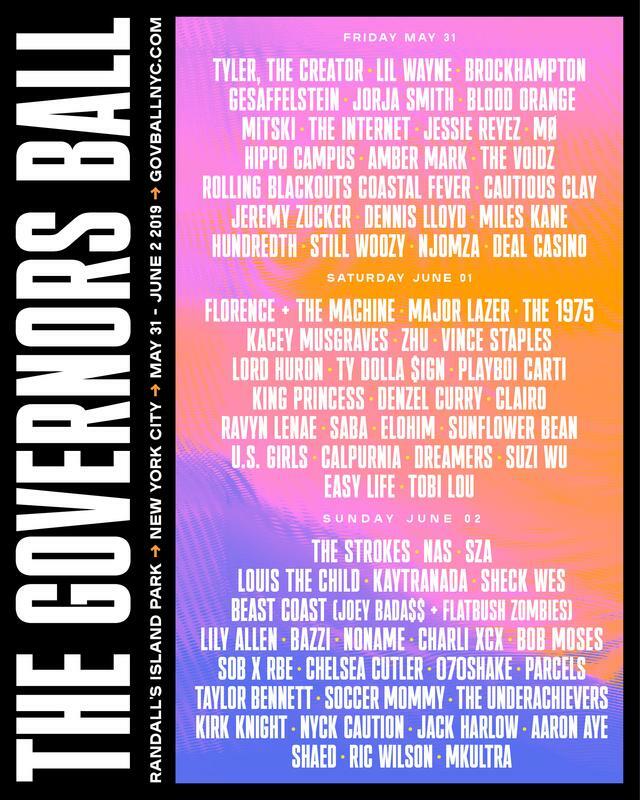 Governor’s Ball has become something like the East Coast’s Coachella (albeit a smaller, more affordable Coachella). Aside from price, the other major distinction is how unabashedly pop-friendly the festival is. 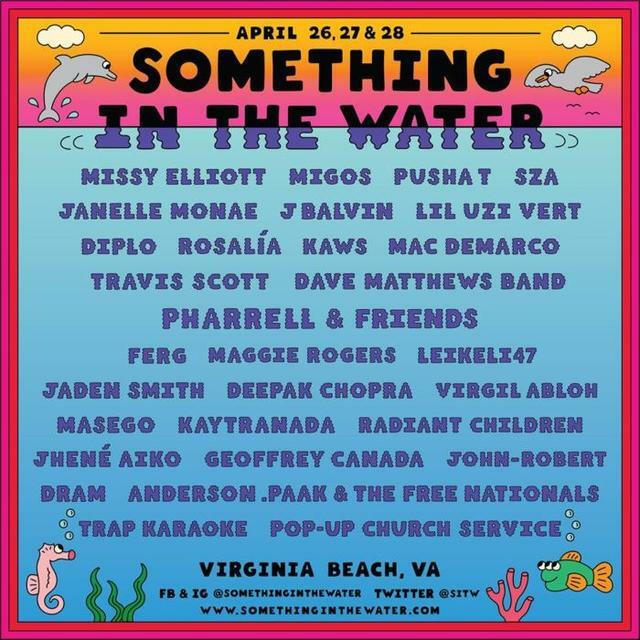 For three days, New Yorkers are delivered a little island that offers an escape from the madness of the city around them, introducing a different madness driven by music, party drugs, and rockstars from across every genre. Must-See Acts: The Roots, 21 Savage, Queen Naija, Blueface, City Girls. If there was any prototype for J. Cole’s Dreamville Festival, it was the Roots Picnic. 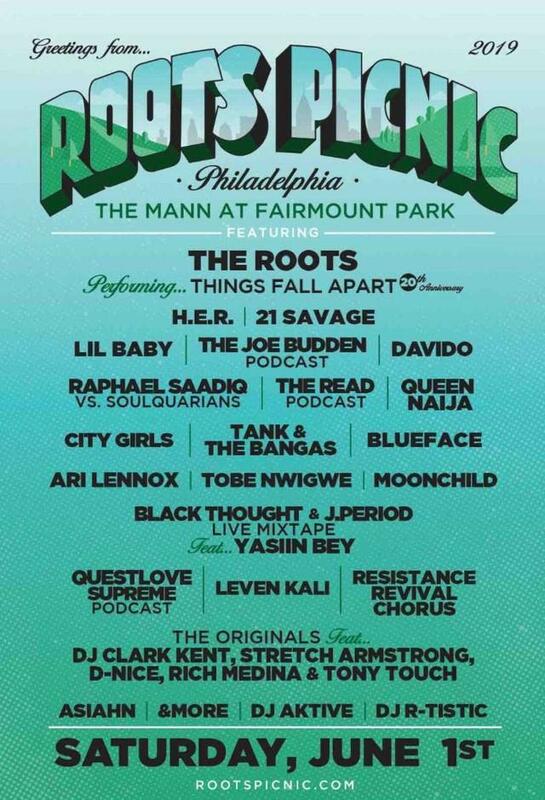 This truly music-centric event has taken place every year since 2008 in the Roots’ hometown of Philadelphia. For a whole day Fairmont Park will be closed off for this event, with affordable tickets and fans of all ages welcome. This year, the Roots celebrate the 20th anniversary of their masterpiece Things Fall Apart. Bonnaroo started off as a kind of festival sanctuary for jam bands and indie groups. What’s impressive is how its promoters has managed to preserve that quality while still attracting some of pop’s biggest stars. 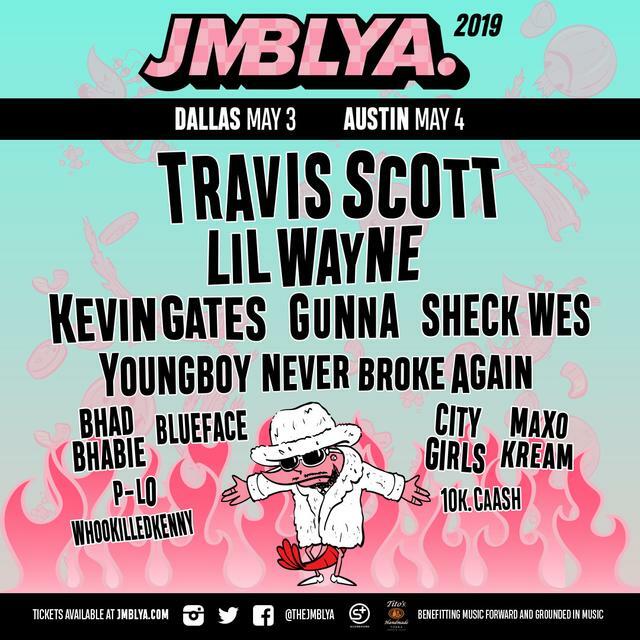 JMBLYA continues to grow with each new year. 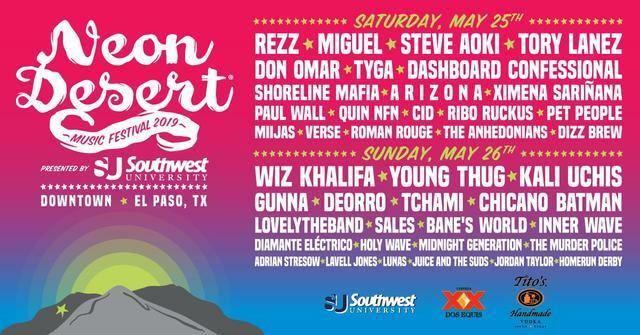 The Texas-based festival also seems to cater more and more to a hip-hop crowd with each year, and this year's line-up is particularly lit if you're keeping up with all the fresh faces and the familiar ones. Last year, the festival earned its largest crowd to date, so we'll have to see if they out-do themselves with this year's line-up. This is another festival that started off with narrow aims. Conceived of as a final farewell for alternative rock band Jane’s Addiction, the event (like the entire alt-rock genre) was absorbed into the music industry’s pop machine. Although, Jane’s Addiction was arguably already part of the pop mainstream by 1991. 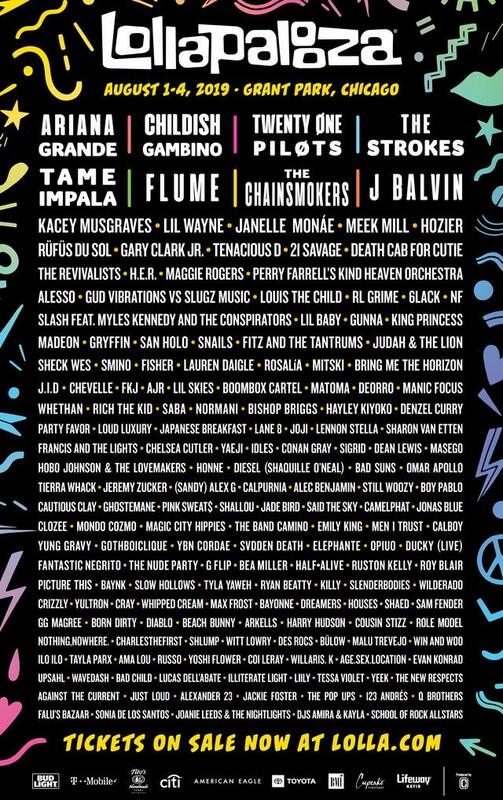 In any case, headliners now include the likes of The Weeknd, J. Cole, and Red Hot Chili Peppers, and there are now Lollapalooza shows hosted in major cities all over the world. 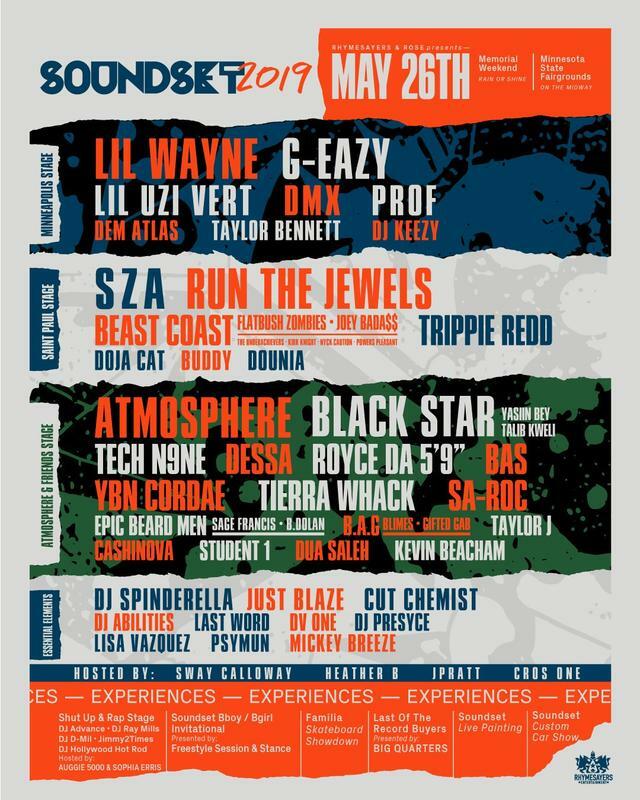 Soundset is an independent hip-hop-centric music festival helmed by Rhymesayers. Thus, every year since its inception, you can expect a good dose of their roster sprinkled into the line-up, including Atmosphere. This year is no different, as they celebrate their 12th anniversary, and call upon a mix of underground and indie favorites with some mainstream superstars -- like Lil Wayne.